Nick Allbrook's large, very round eyes blink questioningly into the screen. He's looking to connect on FaceTime, but it feels like he's searching for himself. Tilting his perfectly spherical head one way and then the other, the medium's delayed transmissions give the somewhat androgynous Allbrook a marionette-like quality. His fluffy bleached hair topped by a cheeky beanie, however, puts him in the rag doll category. Allbrook's musical background is impressive. 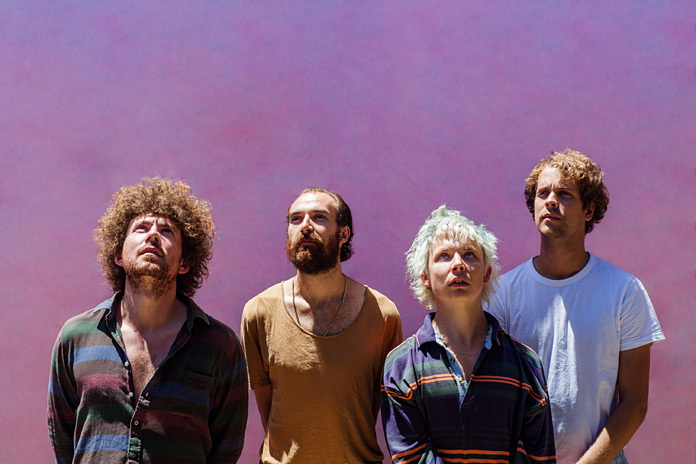 As the frontman for Australia's POND, he's released seven albums in about seven years alongside the other core members, Jay Watson and Joe Ryan, and more recently Jamie Terry. Allbrook and Watson have also been in the touring band for Tame Impala, while Ryan heads up that group's visuals department. But for the last three albums, including the latest, The Weather, Allbrook has focused primarily on POND. "There was more to it than just doing POND," says Allbrook hesitatingly of his departure from Tame Impala, whom he was playing with partially due to being housemates with that group's central figure, Kevin Parker. "There are more important things than rock band and rock band world. But the influence between each other is massive. Not so much because we're touring but because we have always been each other's music school, and we still are." This has been the case since the various members of POND and Tame Impala and their overlaps were in the mainly dormant group, Mink Mussel Creek. Branching off into different projects, their musical ventures continued to intertwine by circumstance. According to Allbrook, "Kevin [Parker] would say, 'I need someone to play guitar. You live in the room next to me, you do it.' We spent a lot of time together so it was natural." Parker—who at one point was the drummer for POND—has produced The Weather, a step more involved than he was on 2012's Beard, Wives, Denim (drums, co-production, co-mixing, co-mastering with Rob Grant) and 2013's Hobo Rocket (mixing). The expected comparisons are drawn between Tame Impala and POND, but The Weather is its own swirling psychedelic animal. From the deep expansive movements of the title track to the shivering rhythms of "Colder Than Ice" to the echoing distortion of "All I want For Xmas (is a Tascam 388)," The Weather has multiple sonic personalities. POND's far-off hometown of Perth is, in part, the influence behind these sonics, its non-cosmopolitan nature suited to the group's mind-blowing productivity. "It's pretty easy to miss and it's pretty dull in a lot of ways," says Allbrook of the city. "It's even got the label of 'Dullsville.' We had an election recently and the ex-Premier was warning us against returning to being Dullsville. But I like Dullsville. What's wrong with Dullsville? Everyone likes Dullsville, that's why we're here. "A lot of the ideas and imagery in The Weather revolve around Perth in the kind of ugly and beautiful way Perth is," Allbrook continues. "But the album isn't making any suppositions or trying to resolve any huge issues. It's just an observation from exactly who we are: confused, scared, white boys."